Brownies. Tender, a blast of chocolate flavor, and a beautifully moist crumb! They are incredibly decadent hot out of the oven with chocolate sauce and ice cream. If you have leftovers, they are soft enough to eat straight out of the freezer. For those times when you want to make a REALLY good gluten free dessert, but don't want to buy 10 (expensive) ingredients at the health food store for only that recipe. The wheat flour needs to be replaced by something; for this recipe, all you need is a gluten free starch (I used potato starch, but you can sub in corn, tapioca or arrowroot starch, whatever is handy), and a gluten free whole-grain flour (I used brown rice, but sorghum, teff, millet, or GF oat will sub). Corn starch and brown rice flour are widely available - go to the baking isle of your local grocery store, and you should be able to find some little bags on the shelf above the wheat flour, if you don't have a "health food" section. In a separate bowl, mix the cocoa, brown rice flour, potato starch, and baking powder. Add the dry ingredients to the butter mix. Mix till combined The batter should be deep brown, sticky and loose, but not liquid. 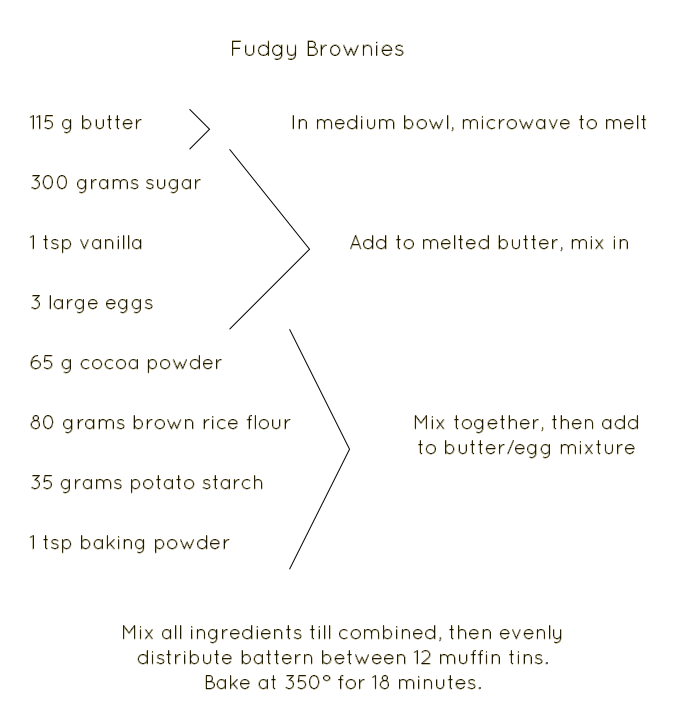 Place muffin liners in the pan (if desired), then distribute the brownie batter between the cups so they are evenly filled. Bake at 350° for 18 minutes, or until they begin to smell cooked, but don't spring back when you lightly touch the top. This is slightly underbaked, for maximum moistness. If desired, bake longer. Allow to cool. Note that if underbaked correctly, the centers will sag in as they cool! I regularly substitute dairy free margarine for the butter, making this a DF recipe! You can swap other gluten free starches for the potato starch, but only by weight. I regularly swap starch for starch in my gluten free baking and it has never given me an issue. You can swap the brown rice flour for other whole grain flours like sorghum, teff, amaranth, oat, or millet. Note that, like the starches, this only works by weight. Also, white rice flour will not swap straight across! This swap only works for whole-grain flour to whole-grain flour. I don't recommend substituting the eggs, as they are the main binding ingredient and liquid.